An employee of a local bank reported a man made threats to her after a dispute. Officer advised him to not go back to that business and his account was closed. A woman reported another woman had been arguing with her and she wanted to pursue slander charges. They were both advised to behave like adults or face charges of disorderly conduct. Officer assisted Ohio Highway Patrol with a vehicle search on West High Street. Marijuana was found on one of the occupants. Officer assisted EMS on West High Street where a man had fallen off of the wall on the west side of the property. He was transported to the hospital by the squad. A resident of Westview Drive reported being assaulted. A summons was issued for assault. A driver struck a utility pole on West Marion Street, destroying both the vehicle and the pole. He was cited for failure to control. A man was cited for driving under suspension and expired registration on North Walnut and Union streets. A resident found a dog running loose in the area of North Main Street. The dog was placed in the kennel at the Morrow County Dog Shelter. A South Delaware Street resident reported a man shooting a gun in the vicinity. When confronted by witnesses, he said he was shooting blanks. He was last seen walking north through the yards. Officers were not able to locate him; a white male, 6-feet tall, thin build and wearing a red hooded jacket. A man was arrested in the 800 block of West Marion Road on charges of expired registration, driving under suspension, carrying a concealed weapon and two counts of possession of drugs. Charges for possession of bulk amount of methamphetamine and trafficking in drugs to be pursued upon receipt of test results. The U.S. Marshal Service arrested a man on outstanding warrants on Westview Drive. Suspected methamphetamine was found on him. A resident of Highland Avenue reported his yard roller was taken from his residence and damage done to his property. Lok-N-Store reported someone cut the locks off of 16 storage units and damaged one door. 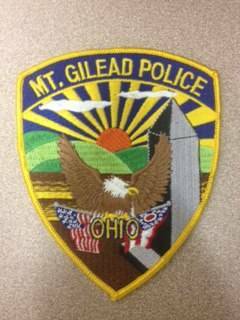 A vehicle backed into another vehicle, which was illegally parked, at Mount Gilead High School causing propert damage. A motorist struck another vehicle at North Vine and East Cedar streets. He was cited for improper operations at a stop sign. Officer assisted Morrow County Sheriff’s deputy with a traffic stop on East Cedar Street. A man was found in possession of drug instruments.